This Zero Gravity case by Ovation offers a durable nylon exterior with a tough foam core and backpack- style straps for easy transport. Accommodates shallow-bodied guitars. This case is sturdy and a great fit. It's not as if there would be very many options available for an Ovation super shallow case. I do wish the inside pocket were large enough to fit a strap in, but at least the outer pockets aren't mesh covered like one gig bag I own. Although the weight is very reasonable for me (and that was a major factor in buying it), it's probably only three pounds lighter than a hard shell case. I would love to find out how safe this case would be for flying. I have two Ovation Celebrity guitars, but I only take one with me to church or to the local nursing home ministry. I wanted something more protective than a regular gig bag, and this Super Shallow Zero Gravity Acoustic Guitar Case sounded like the answer. I've been more than pleased with my choice. It's so much lighter than a hard shell case; at almost sixty-five, I find that more important than I would have a few years ago. It seems durable enough, and I love the concept of part gig bag, part hard case. Around town, I couldn't want anything better. Although this case arrived with a few loose threads, that wasn't worth making a fuss over. I think this case is high quality overall. I forget exactly how much I paid for this case, but I know I could purchase a hard shell case for only a relatively few dollars more. At first, that might tempt me to say this one was too expensive. However, if I compare it with other gig bags and take the shells features into consideration, it probably isn't drastically overpriced. 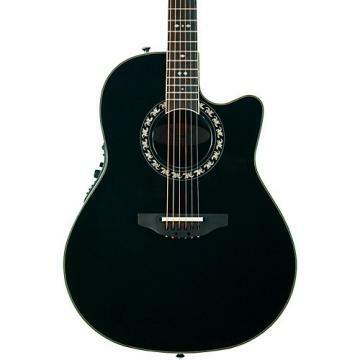 .i ordered an ovation cc48 from here and figured it would be a hard guitar to buy a case for, so i went and bought this. It's not bad, fits the guitar real well, has a couple pockets on the front for storage (although you can't fit anything too wide because they don't stretch well) and there is also a nice, good sized pocket inside under the guitar neck. I store a spare set of strings, a capo, a cable, some picks, and a strap (because it wont fit on the guitar in the case) all in the inside pocket, so that's handy. The back has this weird back pack style strap that seems kind of set low. i would have liked it set higher. if you sling it over just one shoulder (which is how i carry it, i'm thirty, not some kid on a skateboard) it seems top heavy and sticks up far. hard going through door ways. But, then again, it has a side handle too, so that's works. All in all it's okay. fits my ovation very snug, which most bags probably would not, given it's odd size and shape, and it seems very durable. I like having a hard shell case on the inside and a gig bag on the outside, gives it a fun sense. I dont really like plain hardshell cases, makes me feel like i should be better than i am! .I was looking for a good, light travel case since I play around town and use public transport. When I got it, it looked perfect. The first time you step down the metro during rushhour you'll realize how bulky it is. You're better off taking it off your back and using de handle. The worst problem with it is that it`s badly made; I've been using it for 7 months and the stitching is coming undone in three different places. Now, I AM very, very careful with my gear and if I weren`t it would no doubt be much worse! .I'd try to save up and go for a better case if possible if not this case could work, but it is pretty annoying trying to fix it. The case has the normal compartment in the case where the neck is to put strings capos and picks, but the two front pockets cant fit anything besides a few music sheets due to it being so tight and thin. The case is made out of some kind of foam that cant support the nails that hinge the two pieces together, the whole case is breaking apart and I do not travel a lot with it. For the price you can't really get a good hardcase so this foam material would have to do. .Case was barely used and is now falling apart. The hinges are coming out of the foam case. Would have spent the extra money to get a hardshell case. .Everything I expected and more. .MUSICIANS FRIEND IS JUST THAT; AN EXACT CASE FOR A SPECIFIC GUITAR.